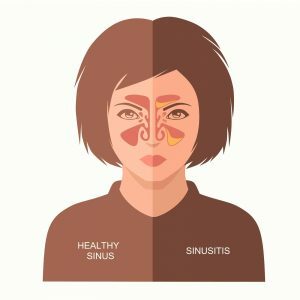 however, many people are not sure if they are suffering from mild sinusitis, allergies, or a full-blown sinus infection. We will explore the symptoms that can help you know when to visit a doctor. When you experience pain behind your eyes, on the sides of your nose, your upper teeth, or your forehead can most certainly be an early sign of a sinus infection. Chances are…. If it hurts, then you probably need to go see a doctor. Having a cold or allergy problems can lead to drainage or an itchy throat, but the color of the discharge/drainage that runs out of your nose (or you cough up) is the sure-fire sign you have a sinus infection. If the drainage is clear then you are in the clear. If the drainage is yellow, dark green, or black… then you need to seek the help of a doctor and antibiotics. A deviated septum can also make this symptom worse. As a sufferer of chronic sinus infections myself, I can let you in on a little secret. If you have a sinus infection, you will have coughing fits at night when you are trying to sleep. These will be pretty violent, and will cause you to lose a few hours of sleep. The chronic coughing is also terrible in the morning, but any doctor will tell you this. So, if you are having horrible coughing episodes at night and in the morning, then you most likely need a medical expert to assist you. Unfortunately mucus from a sinus infection does not just cause nasal drainage, but also causes mucus to drip down your throat… and that is gross and painful. The mucus will irritate and inflame your throat, which leads to a sore throat. The longer you wait to see a doctor, the more intense the pain becomes. If any of the above symptoms seem prevalent, then you should go see your local ENT. If you have a fever, very strange drainage coloring, or intense coughing fits at night or in the morning then it is time. An infection can only be cured promptly be antibiotics, and nose sprays are not going to get the job done any longer.